* What state are you sending gift to? * What is a gift or occasion ? Ready to send a gift to Canada? We're here to help. From unique items with local charm like a breakfast gift basket complete with Canadian maple syrup, to a wine and cheese hamper perfect for celebrating a wedding or special occasion, look below and discover hundreds of options that will delight the lucky recipient. You can sort by holiday, occasion and price point. If you need it to arrive fast, select expedited shipping and you'll find the perfect option with two-day delivery. The best part about shopping at GiftBasketsOverseas.com is that there are no more worryies about your package getting stuck at customs because of gift taxes. Each of the options below are already in the country so they're guaranteed to be delivered fresh and on time. That's why tens of thousands of people around the world choose us when they need to send gifts to Canada. Can I Bring a Gift to Canada? Yes, you can bring gifts across the border from the US and other countries. However, if the total value is $60 CAD or higher per recipient, you will need to pay a duty tax. This can change so it's always a good idea to contact the Canadian Border Control Agency to make sure you have the most recent information. It's also important to know that the package must have a card or other notice declaring it is a gift. Tobacco, beverages that cause intoxication, advertisements and items from a business to a consumer do not quality as gifts and will be looked at differently. If you're bringing these types of items, you'll want to contact Canadian customs before trying to cross the border with them. What is the Easiest Way to Send Gifts to Canada? The easiest way is by selecting a gift basket company in Canada. By doing this you can avoid border taxes, use taxes and the item getting lost in or damaged during transport. If it's a food for example, it could spoil if it gets stuck in customs or potentially confiscated. If it is over the price threshold, it can get stuck at the border until the taxes are paid, and who wants to have to pay a tariff on what was supposed to be a fun surprise? What Are Canada's Public Holidays? The post office is closed on the following holidays. If you need to guarantee gift delivery to Canada, choose a private carrier instead of public postal services or a gift delivery service in Canada like ours. What is the Cheapest Way to Send a Gift to Canada? The least expensive way to send gifts to Canada is through a delivery service. Everything else depends on where you are based. If you're sending from the US, USPS will be the least expensive if you want to skip an international gift delivery service. From Europe, Asia and Australia, boat is the cheapest way to ship a gift to Canada is by boat, and sending by plane or next-day air is quick, but the most expensive. Much like other English and French speaking countries, traditional options are always welcome for holidays like Christmas or Boxing Day. However, Canadians are very proud of their country and when you're choosing business gifts for someone in Canada, try to select something with items that are made in Canada. By doing this you'll be showing you understand their pride in their culture. 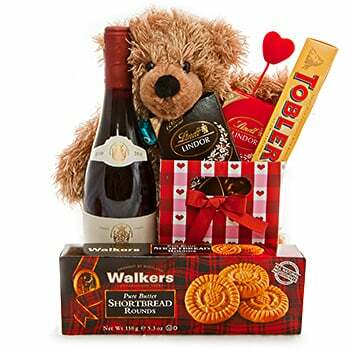 If it's a personal gift for Christmas or a birthday, you can't go wrong with a food basket or something celebratory like champagne and chocolates. Yukon Territory, and large cities in Canada. Interested to have gift delivered to Canada from your country?